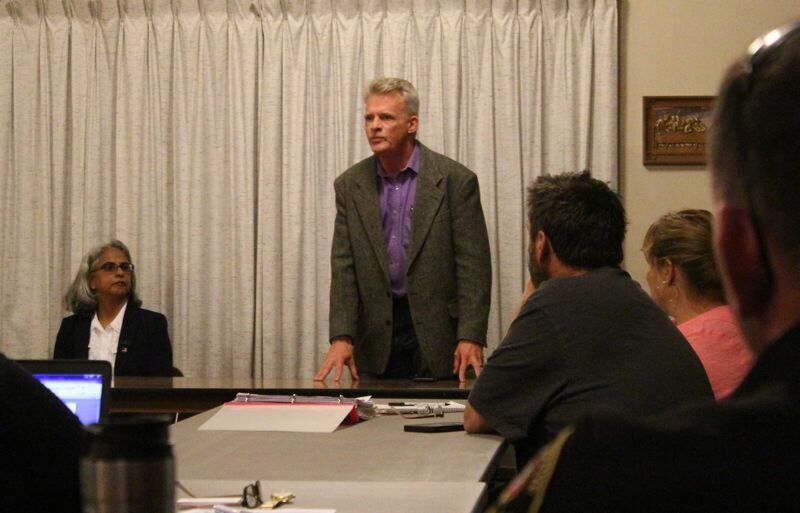 CPO 13 hosted three legislative candidates at its October meeting on Wednesday. 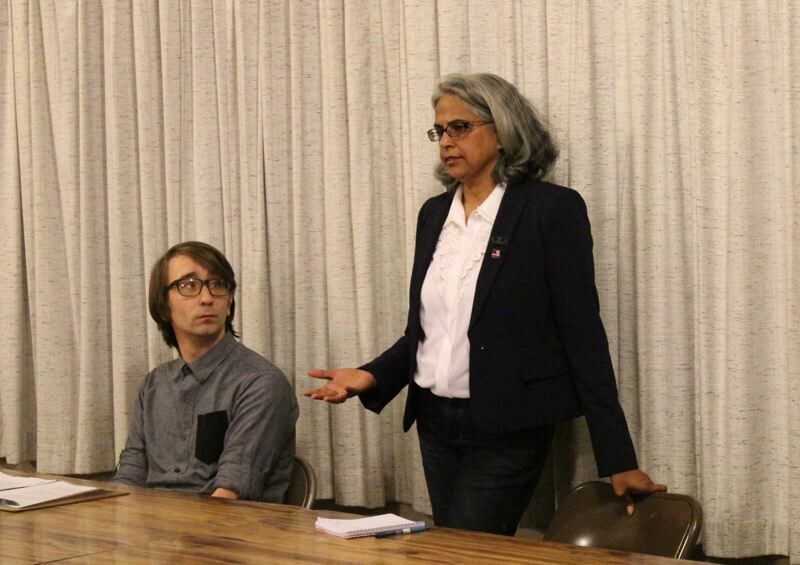 Three of the four candidates running in House District 32, a geographically large district based on the North Coast but which includes parts of western Washington County, appeared at a forum Wednesday night, Oct. 10, in Gales Creek. Republican nominee Vineeta Lower, Independent Brian P. Halvorsen and Libertarian Randell Carlson took questions from the moderator and audience members at the monthly meeting of Community Participation Organization 13, a group that represents residents of the Gales Creek, Verboort and Roy areas and acts as an advisory body to the Washington County government. Tiffiny Mitchell, the Democratic nominee and presumptive frontrunner in the race, did not attend the event, citing a scheduling conflict. Her campaign manager, Thomas Rogers, delivered a roughly three-minute statement in her place. Questions touched on a variety of topics, including gun rights, public education and affordable housing. From the audience perspective, Halvorsen, Lower and Carlson sat at the table at the front of the room in the Gales Creek Community Church of God from left to right, and that's roughly how they lined up ideologically on their answers, too. Halvorsen is a Rockaway Beach planning commissioner who is cross-nominated by the Progressive Party of Oregon, although he identifies as an Independent (the smallest by far of Oregon's official three major parties). He described himself at the forum as a "big supporter" of Sen. Bernie Sanders, I-Vt., who mounted a dark horse campaign for the Democratic nomination for president in 2016. Lower is a Seaside resident who teaches at Oregon Virtual Academy, an online public charter school. She is the Republican nominee, "but more than that," she told the audience at the forum, "I'm Vineeta Lower, running to represent you guys." Carlson is an engineer and relative newcomer to Oregon, he acknowledged, having moved to the state earlier this decade. He said that while he doesn't agree with the Libertarian Party of Oregon on everything, he is generally in accord with its beliefs that government should be "decentralized," with local communities having more of a say in how they tax, regulate and partner with the private sector, the latter of which he repeatedly suggested as alternatives to raising and spending state revenue on areas like education, housing, high-speed internet, climate change and more. On the topic of gun rights, both Halvorsen and Lower said they support "common-sense" measures to place some limits on ownership. Specifically, Halvorsen said that AR-15 semi-automatic rifles and so-called "bump stocks," which can effectively convert a semi-automatic weapon to automatic fire, should not be available, while Lower suggested openness to expanding background checks. Both said the rights of hunters should be protected. Carlson took a different tack, arguing that the Second Amendment is intended to allow people to protect themselves from the government. "I believe in the Second Amendment, the right to bear arms," said Carlson, who then attempted to define the operative word: "I think 'arms' would be just about anything. You could have a nuclear missile, in my opinion." On education, Halvorsen came in well to the left of the other two candidates, suggesting he wants to end a number of corporate tax breaks and credits in Oregon, and to put that increased revenue toward funding public education. "What I want to do is earmark some of those funds for education and look at some of the tax loopholes that we have on the books," Halvorsen said. Carlson and Lower said Oregon should resist raising taxes in order to pay for better education, with Carlson suggesting companies like Intel could step in to fund capital projects at schools and Lower suggesting school districts could cut administrative and other overhead costs. All three candidates approached a question on the Legislature's role in addressing housing and homelessness differently. Halvorsen said that in Rockaway Beach, the development code has been loosened to allow accessory dwelling units, sometimes known as "granny flats." He'd like to see the city go further and try to coax people who own "vacation homes" in the coastal city to rent them out or sell them so that people who need housing have somewhere to live. In general, he said, he supports a broader approach to public housing. "Here in rural Oregon, what I think we should do is invest in public housing … regular, individual, single-family homes that the state maintains, that the state comes in and helps people get into and prioritizes by need," Halvorsen said. Lower recounted an anecdote she said she heard on the campaign trail from a residential builder who, after experiencing some delays, found that the cost of lumber had increased so much that he wasn't able to turn a profit on a construction project he had agreed to do. "It's very important that we make sure that we don't permit ourselves out of these homes," she said. Carlson said housing is a problem in the area, but he would rather see private companies and nonprofits step up to fill the gap. "Nothing happens in government without taxation … so let's look at other options," Carlson said. Mitchell's surrogate, Rogers, described the Democratic nominee as someone with both personal and professional experience with not earning enough to always make ends meet. A social worker with the Oregon Department of Human Services, Mitchell "sees firsthand how so many families get dragged down" by the cost of healthcare, including mental health and addiction recovery services, he said. Her platform includes increasing funding for education and expanding healthcare availability. Not including people affiliated with the candidates, all of whom drove out to the forum from the coastal communities where they live, there were about 15 people at the CPO 13 meeting, including group president and moderator Chas Hundley. The forum was the second the CPO has held this fall for candidates in local legislative races, with contenders for House Districts 29 and 30 appearing last month when CPO 13 met in Verboort. HD 32 is a district that has long been represented by Democrats — currently by Rep. Deborah Boone of Hamlet since 2004, and by Elaine Hopson of Tillamook before her. Registered Democrats outnumber registered Republicans by more than 3,000 voters in the district, according to statistics from the Oregon Elections Division. Mitchell has also far out-fundraised Lower and the other candidates in this year's race, hauling in more than $278,000 as of Thursday, Oct. 11, to nearly $124,000 for Lower, state campaign finance filings show. Boone is retiring after the end of her term. She did not endorse Mitchell in the Democratic primary, instead supporting Tillamook County Commissioner Tim Josi, a more conservative Democrat. Since losing to Mitchell in the primary, Josi has endorsed Lower in the general election.